C.C. Motosko, G.A. Zakhem, R.S. 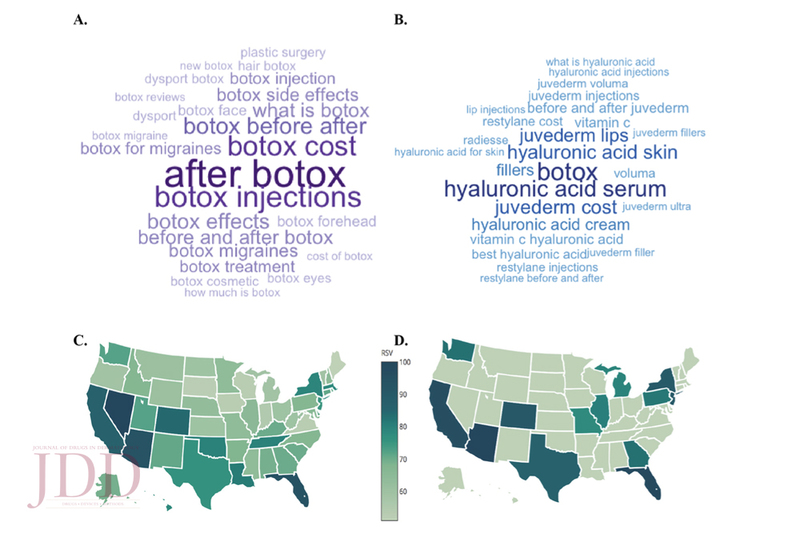 Ho, et al from NYU Langone Health, New York, NY conducted a study where they applied Google Trends to correlate relative search volume with patient demand for botulinum toxin and hyaluronic acid fillers. The authors used the keyword botox to quantify searches for botulinum toxin type a and [Hyaluronic acid + Juve-derm + Perlane + Restylane + Prevelle] for hyaluronic acid soft tissue fillers. Queries were limited to those performed within the United States from January 1, 2005 through December 31, 2016; all query categories were used. The following data was obtained: relative search volume (RSV) over time, RSV among states, and related queries searched for with the above terms. Those searching for hyaluronic acid explored differences between brands and formulations. Florida was identified as the state with the highest RSV for both search queries. FIGURE 1. Visual representation of Top search queries, in which the size of each query’s type is proportional to RSV for (A) [botox], (B) [Hyaluronic acid + Juvederm + Perlane + Restylane + Prevelle]. Heat map depicting search interest in (C) [botox], (D) [Hyaluronic acid + Juvederm + Perlane + Restylane + Prevelle]. Search volume for [Hyaluronic acid + Juvederm + Perlane + Restylane + Prevelle] was sufficient to generate RSV in only 13 states. The authors findings highlight the importance of Google search data as a resource for understanding patient motivations and behavior. Dermatologists may use this resource as a tool to better address patient concerns and forecast local demand for specific procedures. 1. Kirchberger MC, Heppt MV, Eigentler TK, Kirchberger MA, Schuler G, Heinzerling L. The tanning habits and interest in sunscreen of Google users: what happened in 12 years? Photodermatol Photoimmunol Photomed. 2017;33(2):68-74. 2. Bloom R, Amber KT, Hu S, Kirsner R. Google Search Trends and Skin Cancer: Evaluating the US Population’s Interest in Skin Cancer and Its Association With Melanoma Outcomes. JAMA Dermatol. 2015;151(8):903-905. 3. Callaghan DJ, 3rd. Use of Google Trends to Examine Interest in Mohs Micrographic Surgery: 2004 to 2016. Dermatol Surg. 2018;44(2):186-1924. 4. Varian H CH. Official Google Research Blog: Predicting the Present With Google Trends. http://googleresearch.blogspot.com/2009/04/predicting-present-with-google-trends.html. Accessed November 3, 2017. 5. Surgeons ASoP. Plastic Surgey Statistics. Source: Motosko, C., Zakhem, G., Ho, R., Saadeh, P., & Hazen, A. (2018). 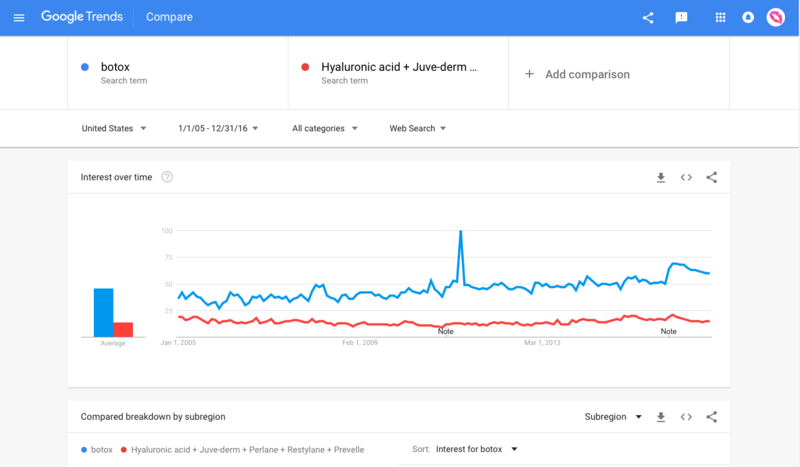 Using Google to Trend Patient Interest in Botulinum Toxin and Hyaluronic Acid Fillers. Journal of drugs in dermatology: JDD, 17(11), 1245-1246. Used with permission from the Journal of Drugs in Dermatology. Did you enjoy this post? Find more on Aesthetic Derm here.